JOE is a full featured terminal-based text editor distributed under the GPL. JOE has been around since 1988 and comes standard with many Linux distributions. Bluefish is a powerful software editor targeted towards programmers and webdesigners, with many options to write websites, scripts and programming code. Size: 4.0 MB - Software License: ? Eddie is a programmers editor for MacOSX and Gnome Linux, inspired by the Macintosh Programmers Workshop. Size: 1.1 MB - Software License: ? Cream is a free, easy-to-use configuration of the famous Vim text editor for Microsoft Windows, GNU/Linux, and FreeBSD. Cream is free software under the GPL. NEdit is a multi-purpose text editor for the X Window System, which combines a standard, easy to use, graphical user interface with thorough functionality. Diakonos is a console text editor with a key mapping you practically already know. Easy to use and easy to configure, but potent in the hands of power users. Geany is a text editor for Linux with basic features of an integrated development environment. It supports many filetypes and has some nice features. JuffEd is a free, cross-platform text editor for programmers and advanced users. It is distributed as free software under the GPL. GNU nano is designed to be a free replacement for the Pico text editor, part of the Pine email suite from The University of Washington. Scintilla is a free source code editing component which includes useful features such as syntax styling, error indicators, folding, code completion and call tips. Vim is an advanced text editor for Linux that seeks to provide the power of the de-facto Unix editor 'Vi', with a more complete feature set. gPHPEdit is a project to develop a GNOME2 editor that is dedicated to editing PHP files (and other supporting files like HTML/CSS). Scribes is an extensible text editor for GNOME that combines simplicity with power. Gummi is a LaTeX text editor for Linux. The software is licensed under the MIT license. CherryTree is a text editor for Linux that allows to easily take notes, featuring rich text and syntax highlighting. It requires GTK2. TkNotePad is a simple Linux text editor that works like the Windows notepad. 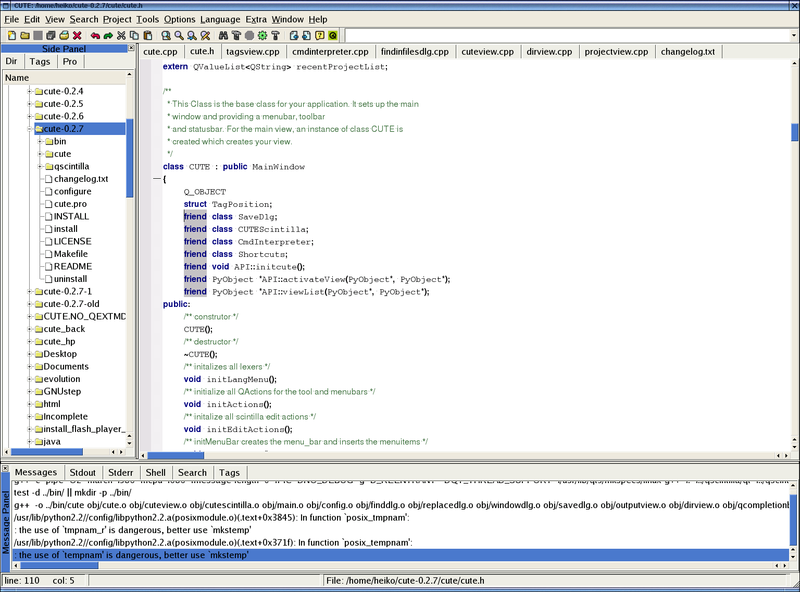 The ale text editor is a basic no frills exitor for the Linux console or an xterm. It has all of the needed functions to quickly create, or edit config files or any other text file. Genesis is a programmers editor for GNU/Linux. Among other things, Genesis supports both a console (vi-like) command-line interface, a basic GUI, and much more. 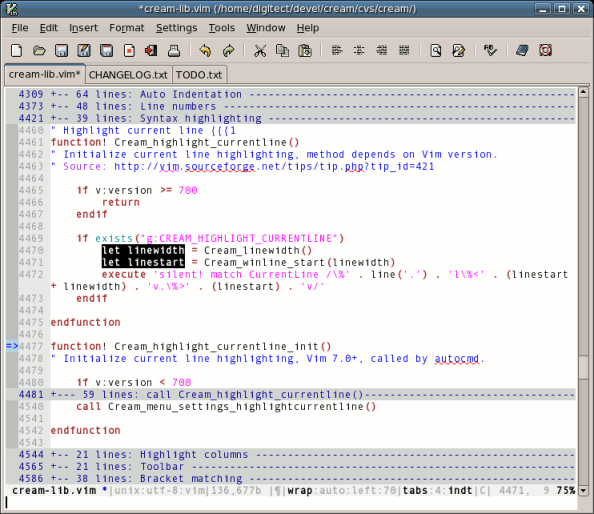 The Edt editor is a simple Linux text editor for rapid text manipulation. Common operations are accessed by single keys on the numeric key-pad. Tony's Tickle Text Editor, or TclText, is a fast, lightweight text editor for Linux written in Tcl.Tk. CUTE is a text editor for Linux based on Qt and Scintilla which can be easily extended using Python. Ibid's Editor is a Linux editor for xanalogical text, which is, so to speak, hypertext on steroids. The Text Trix editor is an open-source text editor with a mind for user-friendly file and text navigation. It works on Linux and other platforms that use Java. oFEd is a Linux offline editor for forum posts. It lets you edit your text offline, save it in file, continue editing later and after you are ready copy and paste it in the forum. TEA is a text editor for Linux and UNIX-like systems and Windows. With an ultimate small size TEA provides you hundreds of functions. djvusmooth is a graphical editor for DjVu documents. WriteOnly is a simple text editor. It is only interested in content and not formating or layout. WriteOnly runs on Max OS X, Windows XP, and Linux. 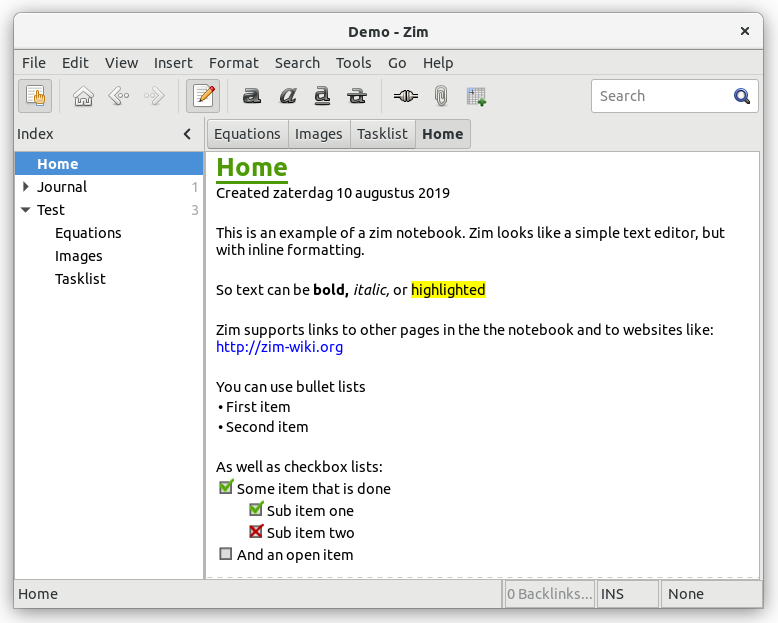 GNU Zile is a lightweight Emacs clone. Zile is short for Zile Is Lossy Emacs. Zile has been written to be as similar as possible to Emacs. Neoeedit is a light but smart Linux text editor for programmers. It requires Java to be installed on your system.